Our old friend Snail Bob is back in the new part of this game. He steel needs your help to pass a long way with a lot of obstacles and traps. Solve a lot of interesting puzzles to help snail to reach his goal. Can you do it? The new part of this fantastic puzzle game by A10 is here. 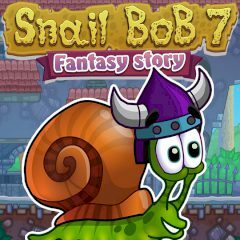 If you missed this funny snail named Bob and, you will certainly like this game. You have a chance to join him in his adventures with new challenges. This games will make you use your wits, and have fun as always. It is an adventure puzzle game full of exciting challenges you will have to be very skillful and use your intelligence to get our friend back home safely, overcoming any danger and obstacles that are in your way. If you liked the previous versions of this, do not wait, because this will not leave you indifferent! At your way you will have concentrate and be very attentive to reach success. You will have to guide Bob using the mechanisms you find in each level. So you have to look around and do not miss a detail. Good luck!